The Volkswagen CC comes in 5 versions. From the entry level model which is packed with features and has an elegant yet practical feel to the head turning Volkswagen CC R-Line Black which boasts performance stats such as 0-62mph in just 8.1 seconds and a fuel return of up to 62.8mpg. Features such as park assist help the driver enjoy the ride more whilst the ambient lighting in the cabin sets the mood perfectly. The interior is dotted with a host of luxuries that offer style and substance. Bi-Xenon headlights mimic natural daylight to aid driver vision at night. The standard spec is impressive with Bluetooth telephone connection, 17 inch alloys, rain sensor and DAB radio all as standard, not to mention the sports suspension. The ride from this handsome saloon is crisp with a sporty feel, safe and secure on the corners with enough grip to make you feel safe. Motorway cruising is exceptionally smooth and comfortable. The CC R-Line version comes with an impressive list of standard features such as R Line styling kit, 18 inch alloys, cruise control, winter pack including heated front seats, sports suspension and parking sensors both front and rear. 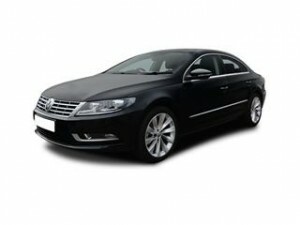 Coast2Coast Cars works directly with a franchise network that has offers on all new Volkswagen CC cars. Simply decide on what spec you would like and then we run it through our online quote system. We can then display the price saving you maybe thousands on a new car. Our service is free and with no obligation at all times. Finance is available too on all models subject to status, this can be arranged prior to purchase.